For centuries the art of marquetry has been centered in Paris, where the tradition has been transmitted only within workshops concentrated in the Faubourg Saint-Antoine. The outside world, therefore, has had very limited knowledge of the techniques used by the masters of this art. The publication of this English-language edition of La Marquetrie gives amateurs, art historians, creative woodworkers, and conservators access to an invaluable body of knowledge of the techniques of marquetry, covering the history of the craft as well as explanations of how a marqueter's studio is organized and the materials, instruments, drawing, preparation, and procedures used in the craft. It combines a thorough explanation of the craft techniques with detailed analysis of period examples, thereby giving readers a better understanding of marquetry pieces and new insights into shop practices. The book is an invaluable resource both for the art historian and the practicing craftsperson. Pierre Ramond is uniquely qualified to write this work. 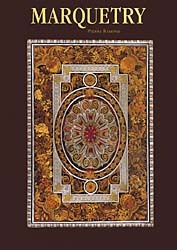 He practiced the art of marquetry for many years in the foremost studio of Paris before turning his energy to educating others in the craft. This title is out of stock indefinitely. Please look for it at your local libraries and/or used bookstores.